One of the big items in the world of computers from the 2007 CES show in Las Vegas is the SSD or Solid State Drive. This is actually technology that has been around for many years, but only now is it actually set to become something that consumer may actually get to use within the next year. This article takes a look at exactly what is a solid state drive and how it may benefit consumers, especially with their portable computing. Solid state is an electrical term that refers to electronic circuitry that is built entirely out of semiconductors. The term was originally used to define those electronics such as a transistor radio that used semiconductors rather than vacuum tubes in its construction. Most all electronics that we have today are built around semiconductors and chips. In terms of a SSD, it refers to the fact that the primary storage medium is through semiconductors rather than a magnetic media such as a hard drive. Now, you might say that this type of storage already exists in the form of flash memory drives that plug into the USB port. This is partially true as solid state drives and USB flash drives both use the same type of non-volatile memory chips that retain their information even when they have no power. The difference is in the form factor and capacity of the drives. While a flash drive is designed to be external to the computer system, an SSD is designed to reside inside the computer in place of a more traditional hard drive. So how exactly do they do this? Well, an SSD on the outside looks almost no different than a traditional hard drive. This design is to allow the SSD drive to put in a notebook or desktop computer in place of a hard drive. To do this, it needs to have the standard dimension as a 1.8, 2.5 or 3.5-inch hard drive. It also will use either the ATA or SATA drive interfaces so that there is a compatible interface. The power usage is a key role for the use of solid state drives in portable computers. Because there is no power draw for the motors, the drive uses far less energy than the regular hard drive. Now, the industry has taken steps to address this with drive spin downs and the development of hybrid hard drives, but both of these still use more power. The solid state drive will consistently draw less power then the traditional and hybrid hard drive. Faster data access will make a number of people happy. Since the drive doesn't have to spin up the drive platter or move drive heads, the data can be read from the drive near instantly. In a recent demo of two similar equipped notebook computers, Fujitsu was able to demonstrate a roughly 20% speed increase in the booting of Windows XP on a SSD over a standard hard drive. Reliability is also a key factor for portable drives. Hard drive platters are very fragile and sensitive materials. Even small jarring movements from an impact can cause the drive to be completely unreadable. Since the SSD stores all its data in memory chips, there are fewer moving parts to be damaged in any sort of impact. Why Aren't SSDs Used For All PCs? 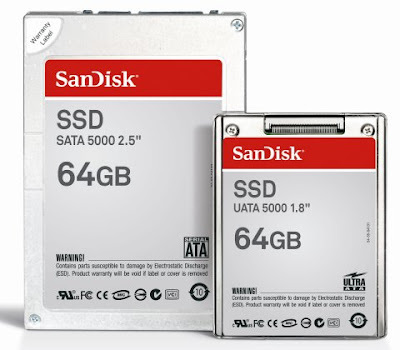 As with most computer technologies, the primary limiting factor of using the solid state drives in notebook and desktop computers is cost. These drives have actually been available for some time now, but the cost of the drives is roughly the same as the entire notebook they could be installed into. This is gradually changing as the number of companies producing the drives and the capacity for producing the flash memory chips grows. Drives announced at the 2007 CES were priced at less than half of the drives of the same capacity from the previous year. The other problem affecting the adoption of the solid state drives is capacity. Current hard drive technology can allow for over 200GB of data in a small 2.5-inch notebook hard drive. Most SSD drives announced at the 2007 CES show are of the 64GB capacity. This means that not only are the drives much more expensive than a traditional hard drive, they only hold a fraction of the data. All of this is set to change soon though. Several companies that specialize in flash memory have announced upcoming products that look to push the capacities of the solid state drives to be closer to that of a normal hard drive but at even lower prices than the current SSDs. This will have a huge impact for notebook data storage. For several years now SSDs have been the up-and-coming storage technology. In the past couple of years, their development has reached a fever-pitch level as the manufacturers of solid state memory continue to find new ways to push more transistors into smaller areas, and the respective controllers continue to squeeze more performance per watt and refine logic on the wear-leveling algorithms. All this is well and good, but I really sincerely believe that pushing these into the hands of every-day users is probably one of the worst decisions from a technology standpoint the industry has made thus far. This is not to say it’s a bad BUSINESS decision, as the flash manufacturers stand to make a lot of money if they can supplant the ubiquitous hard drive, but that doesn’t make it the right decision. First, here is brief history for the readers who might have stumbled upon my 2nd blog entry and are saying “Just what is this cat talking about?” Solid state disks (SSDs for those in the industry) are, for lack of a better description, an extremely close relative to the storage cards (SD, CompactFlash, etc.) you use in your digital camera or cell phone. The differences lie in the minutia of manufacturing, and that most SSDs utilize onboard controllers, while most memory card technologies have their controllers on the device. Onboard controller are useful because they reduce the delay induced by having to make the calls to the NAND flash that in memory cards happens over most times a friction-based connection. For the sticklers out there, yes there are solid state drives based upon volatile DRAM which are quite different in technology, and will be addresses in a later article. NAND-based SSDs are going to be the topic of conversation, since they are becoming more wide-spread as the days roll on. For more information, Wikipedia has excellent resources on solid state drives. I have always been an outlier when it comes to recommending upgrades. The first two things that come out of the typical IT person’s mouth is usually “Processor” followed by “RAM,” with the two flip-flopping positions depending on who you talk to. I have always recommended hard drives as being the key place of interest to be spending money to increase speed. I once read a statistic that if we were to scale the amount of time a processor spent waiting for the disk to retrieve data to a number we would grasp, it would equate to around 100,000 years.“But why, Matt? Processors and RAM are so easy to upgrade and the difference is usually noticeable immediately.” Ah, that might be true, but with the advent of cheap huge storage devices, like hard drives, external NAS, and big RAID arrays, more and more programmers are beginning to advocate that utilizing the disk is not a huge issue, since the space is there to do it. Windows Vista/7 shipped on a DVD, and Red Hat takes 6 CDs or 1 DVD, just to give a few examples. So our reliance on hard drive storage is becoming greater and greater. The largest problem with hard drives is their rotational latency. Since it’s a moving part with a few read heads, the drive has to be spun to the spot where the data is stored, and the head has to move there to read it. The more data you pack onto a hard drive platter, the more data is in a particular square centimeter, and thus the head doesn’t have to move so much to gather a lot of data. This has seriously improved the 3.5” drive market, and been a huge boon to the 2.5” drive market, as the enterprise versions of those drives are reaching speeds equivalent to the 3.5” drives. Solid state disks though far surpass the performance level of today’s spinning hard drives, as the data is available instantly. And even if the fastest 15k drives can still spool data faster once they have searched to it, the smaller files are basically instantaneous on a SSD while you are still waiting for a normal drive to find the same file and begin to transfer it. Now, I just sat here and typed a whole page to what SSDs are basically going to be the next best thing since sliced bread (for computers anyway). Why the dismal title of it being not a good thing for the masses? If I had to phrase it up in a word, it would be “size”. SSDs are never EVER going to match up with classical hard drives when it comes to price per gigabyte (soon to be terabyte). 1.5TBs are quickly approaching the $100 dollar barrier and below. 1TB SSDs are still floating around 1,000 dollars, and are in such short supply that you will probably never be able to actually acquire one unless you are a medium to large OEM. Yes, I used the word “never.” In fact, never EVER was the phrased I used to describe and I’ll tell you why. Hard drive manufacturers are going to continue scaling their technology at a rate as fast if not faster than SSD manufacturers because they are working with proven technology that all they have to do is tweak, whereas SSD manufacturers are plagued by manufacturing defects and controller issues. This is not to mention the huge supply chain issues they face as they try to scale the size of the drives up to compete with classic hard drives. A classic hard drive spins on a metal composite platform with a metal coating that is very weakly magnetized so that the read heads don’t adhere to the surface and can change the polarity of the individual sectors to indicate a 1 or 0. SSDs on the other hand require very specialized silicon that is in short supply already because of the stresses of other manufacturing processes that utilize it. So what is the solution? Well, we had one that everyone just seemed to graze by: hybrid drives. 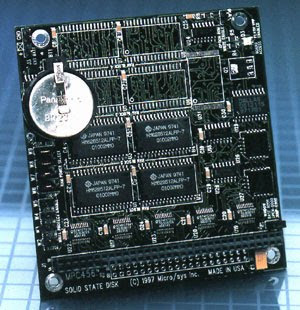 These utilized a cache of memory that front-ended a spinning drive platter that was used for storage. This technology was pioneered by Samsung and has now basically been forgotten by most of the tech industry. Part of the problem was the blending of two separate markets (Samsung happens to be a part of both), and part of the problem was the lack of logic in the software world. Windows specifically had no idea how to take proper advantage of the technology, which is just a lack of proper programming on their part, but that’s not to say everyone else didn’t completely miss the boat as well. Now we have this raging feud between the flash producers versus the hard drive manufacturers, and in the end the consumer is going to lose because if the two groups had pooled their development dollars into the hybrid drive technology, we could probably have the best of both worlds at this point. Well I think that’s enough for this week. Have a great week everyone, and enjoy the holiday for everyone who celebrates it here in the USA. Tune in next week.